Fifteen Acre Farms Australian Shepherds, established 2005 for the improvement and promotion of the breed, is located near Talala, OK. Our breeding program and facilities are AKC, State of Oklahoma, & USDA licensed, inspected, and approved with the highest ratings. To view our available puppies click here: http://www.fifteenacrefarms.com/available_puppies.html then click on each female's picture to view her litter. 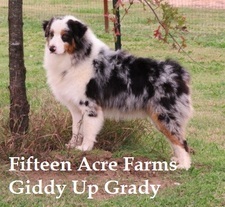 Subscribe to our youtube channel at Fifteen Acre Farms Australian Shepherds! Contact us at fifteenacrefarms@yahoo.com or call or text Laura Perry at 918-706-1931. Fifteen Acre Farms Australian Shepherds currently has an IMPRESSIVE selection of OUTSTANDING AKC/ASCA registered puppies from health tested parents for your consideration. Every effort has been made to assemble and maintain a breeding program from the finest of the breed consisting of the proper balance of intelligence, health, & beauty. As a result, we produce quality healthy offspring for our buyers to make their selection from that transition quickly and well from our care to yours with a terrific start on obedience training, potty training, and sleeping through the night. AKC AND ASCA registration documents are available at time of transfer of ownership and pedigree’s and lab reports for important genetic health testing are posted for your review. When you make your selection from Fifteen Acre Farms Australian Shepherds there is NO guess work regarding genetics, quality, or representation of the breed. Families and breeders from Canada, Mexico, Netherlands, Puerto Rico, & 45 US states have made their selection here so we have plenty of references available & experience transporting live animals via Priority Parcel Service on American, Delta, & United Airlines. Air travel in the continental United States, Alaska, Puerto Rico, & US Virgin Islands is $500 for one puppy or for two puppies flying together at age 8 or 9 weeks. Because we are centrally located in the US, our puppies are only in transit 2-7 hours depending on destination. Read the Shipping page to address any concerns you may have regarding air travel for live animals. Make your selection from a breeder who KNOWS and REPRESENTS the breed WELL.